A $500-a-ticket charity benefit gala for "Special People United to Ride of Monmouth County", an organization that employs horseback riding as therapy for handicapped children. 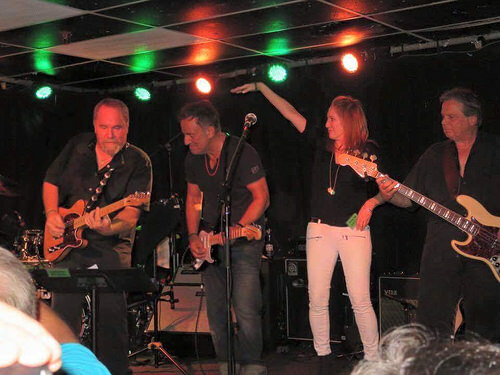 Springsteen joined Bobby Bandiera's band (house band for the night) on "Mystery Train" early in the evening. Later Bruce, along with Patti Scialfa, Jon Bon Jovi and Max Weinberg, took the stage for a 45-minute set of oldies. Springsteen signed and auctioned off one of his Stratocasters for $30,000 and then auctioned off a 1 hour private guitar lesson with himself that fetched a whopping $50,000! Bruce and Patti, along with Lisa Lowell, perform with Timepiece (Patti's brother Mike Scialfa's band) at a private party for friends. Bruce mainly played guitar that evening, but did provide lead vocals on "Oh, Pretty Woman" , "Born On The Bayou" and "Brown Eyed Girl". Springsteen's first known performance of Stevie Ray Vaughan's "The House Is Rockin'". Seems that I'm always thinking of you. I love you madly, you really got a hold on me. Don't want to kiss you, but I need you. My love is strong now you really got a hold on me. Hold me, hold me, hold me. Don't want to spend another day here.